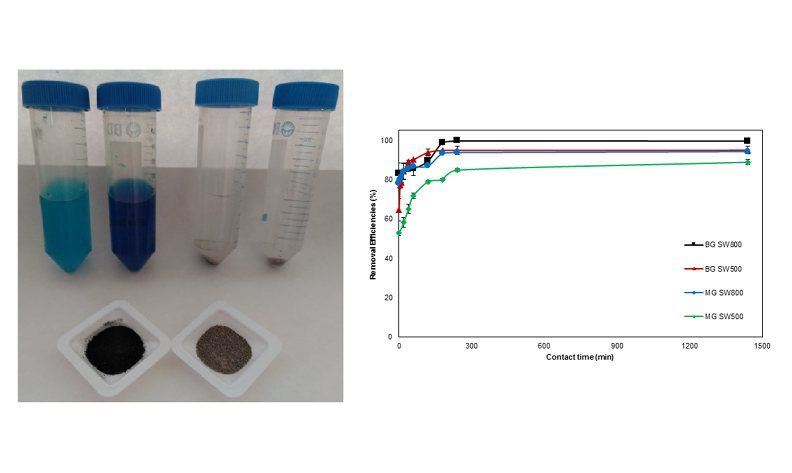 Sandpaper wastes were used as adsorbent after pyrolysis at 500 °C and calcination at 800 °C for the removal of brilliant green and malachite green cationic dye from an aqueous solution. The effects of the pH, the adsorbent dose, the contact time, and the initial dye concentration on the removal efficiencies were investigated. The isotherm studies were conducted by using the Langmuir, Freundlich, and Dubinin-Radushkevich models, and thermodynamic studies were also performed. The adsorption of the Brilliant green and malachite green were found to comply with the Langmuir isotherm model and the Freundlich isotherm model, respectively. The thermodynamic studies showed that the adsorption of dyes were endothermic. The E values obtained from the Dubinin-Radushkevich isotherm showed that the adsorption mechanism was chemical in nature. Furthermore, the three kinetic models (pseudo first-order, pseudo second-order, and intraparticle diffusion) were investigated. It was found that the pseudo second-order kinetic model fitted well for adsorption of dyes.